IS SERVICED OFFICE SPACE RIGHT FOR YOU? Whatever the size of your business, if you need to rent premises to run your operations from, then that rental fee is likely to be one of your company’s biggest expenses. Not only that, but if you lease a traditional office space, you will usually be bound into long fixed term contracts, and in addition you will also need to fork out to furnish and decorate the interior, and maybe even for any running repairs that need doing in the future. With serviced office space, many of these difficulties are overcome. For a start, the offices in question are usually furnished and ready to go – everything from desks and chairs, to internet connections will be in place and operational from the minute you step in the door, meaning you won’t suffer any downtime waiting for new lines to be installed. Extras such as photocopying and meeting room hire is often also available, for a per unit or per hour charge; this gives you the flexibility of adding extra services as and when you need them. Reception services and security may also be included in the rental price. Does this all sound too good to be true? Well here at Arrow Mill we offer all of this and more, all for very competitive rental prices. 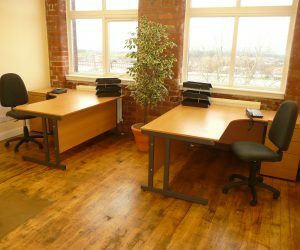 We are filling up fast though so if you are on the hunt for offices in Rochdale, please contact us. One of our helpful, friendly members of staff will be only too happy to speak to you and show you around. You can either call us on 01706 716000, email us on info@simplestorage.co (and we are just .co!) or pop in to see us.